A photo of two loyal Red Sox fans at Camden Yards in Baltimore last night. It is remarkable how many Boston fans there are at an Orioles game. Unfortunately for these sisters and the rest of us, it was also "2 losses" by the end of the second game in this series. I didn't get the names of these two people. If any of you know them, please forward this link. This report of recent activity in Massachusetts may be of special interest to my out-of-state readers. The insurance exchange set up by the Legislature when the MA health care access bill was passed has gotten very good grades. The folks there have had many things to balance, and they have done it thoughtfully. This report was posted on April 22 by Glen Shor, the current Executive Director. He succeeded Jon Kingsdale last April. April showered us with reasons to be optimistic about the state of health care reform in Massachusetts. Faced with projected 11% membership growth in the Commonwealth Care program next year as people lose unemployment benefits - and no additional resources to cover that growth - we encouraged our Medicaid managed care organizations to deliver high-quality, cost-effective coverage for less. They came through for the taxpayers with savings of $80 million, meaning that our members will not have to face the prospect of benefit reductions or unaffordable co-payments. There was also good news for small business owners looking for an easy way to find affordable health insurance for their employees. Starting in July, we are eliminating all up-front fees for purchasing coverage through the Health Connector and will be launching a wellness program and premium discounts for qualifying small businesses. Within a few months, we will also be expanding the choice of health insurance carriers available to small businesses through our easy-to-use, online shopping experience - and even adding an additional carrier for individual purchasers. Our unsubsidized Commonwealth Choice program has doubled in membership over the past year-and-a-half, and these upgrades should make it an even more appealing tool for comparing options and choosing coverage that best suits one's needs. And, of course, the fifth anniversary of Massachusetts health care reform was officially marked by Governor Patrick and others at the Dorchester House this month. While we are proud of the fact that 98.1 percent of our residents and 99.8 percent of our children have coverage, the event poignantly showcased that reform isn't just about numbers. It's about helping people. We're succeeding on both fronts. On the national scene, the Massachusetts experience continues to be closely examined as other states begin to develop their health insurance Exchanges. Partnering with MassHealth and the University of Massachusetts Medical School, we were successful in obtaining a $35.6 million three-year federal grant that will not only help us share our technological knowledge and practices with other New England states but also improve our web-based shopping experience for Massachusetts consumers and small businesses. A friend had some complaints and suggestions about a relative's stay in a New York City hospital. She asked me for advice as to how she might best get a response from the hospital, and so I of course suggested that she write to the CEO. She did get a timely response, which she shared with me. The stunning aspect of the reply was that it was from the "Patient-Centered Care Department." Should we feel good about this? I think not. The idea that there should be a department of this name is like suggesting that there should be a similar department named "Avoiding Nosocomial Infection Department" or "Let's Operate on the Right Site Department." Patient-centered care -- or as I prefer, patient-driven care -- is not the purview of a separate department. It is the job of the entire hospital and all who work there. By creating a department with that name, you suggest that most staff members are free to let that part of the mission be in the hands of others. A recent study* reported in Medscape Today summarized the likely factors leading to medical, medication and laboratory errors in eight countries -- Australia, Canada, France, Germany, the Netherlands, New Zealand, the UK and the USA. What is striking is the commonality across jurisdictions, irrespective of the type of health care organizational structure, including this conclusion: "Greater understanding by patients of the risks associated with health care could help to engage patients in participating in error-prevention strategies." Here are some excerpts from the discussion portion of the article. This study found . . . a number of statistically significant relationships between experiencing an error and a patient's age, education level, presence of chronic conditions, prescription drug use, number of doctors seen, poor provider communication, poor care coordination and ED use. Overall, the three risk factors with the largest ORs** in the final regression model were (i) experiencing a care coordination problem, (ii) having seen four or more doctors within the last 2 years and (iii) having used the ED in the last 2 years. All three of these risk factors suggest issues with coordination, continuity of care and provider knowledge of the patient. Experiencing a coordination problem had the largest OR of all the explanatory variables. This is consistent with literature that suggests that gaps in the continuity of care can create opportunities for errors to occur, and that hand-offs between health care professionals are an important element in ensuring greater patient safety. Furthermore, gaps in coordination are an aspect of patient safety that is often very apparent to patients when they occur. Educating patients and increasing their degree of involvement in treatment plans may help to reduce the likelihood of errors occurring by empowering patients to speak up and ask questions about why certain tests are ordered and how they relate to their diagnosis. * Andrea Scobie, "Self-reported Medical, Medication and Laboratory Error in Eight Countries," International Journal for Quality in Health Care. 2011;23(2):182-186. ** The odds ratio (OR) for each explanatory variable was calculated to determine the relative risk of experiencing an error given each hypothesized risk factor. There are many interesting problems involved in implementing a capitated approach to health care payments, from the internal transfer payments among providers to questions about consumer choice. How can the Commonwealth decide that heading down this path is worth the strife if there is no objective analysis of the main proposal for changing that payment system? Thus far, we make policy in a vacuum, only hearing from those organizations who have a vested interest in proving that this approach is the right one. In speeches and advertisements, they try to marginalize others who raise concerns. It is time for Massachusetts to conduct a formal test of the global payment hypothesis. I continue my occasional series about signage in and around Boston. Here is one recently seen on the #77 bus that runs down Massachusetts Avenue from Arlington Heights to Harvard Square. I don't recall seeing this sign on other routes, but it may be elsewhere. 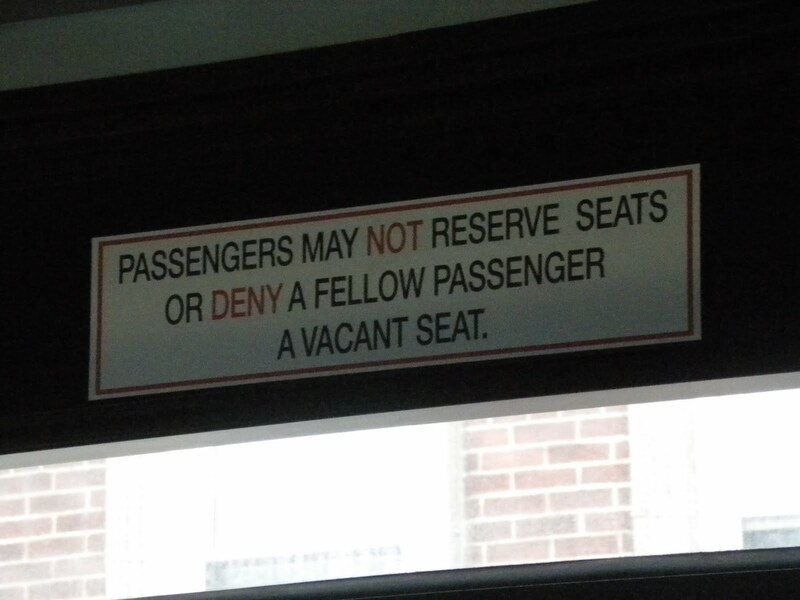 What does this say about the clientele on this bus route, or others, that such a sign would be necessary? I fear it is not a very nice indication of people's manners. Maybe we should expect it though, as people have been trained to believe that saving spaces is acceptable behavior when there are snow storms in Boston. Well, it is clearly the end of the semester, as I am being invited for interviews with many graduate students who are finishing term papers. 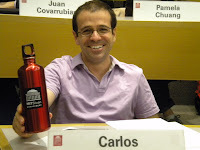 Even more interesting is that the papers seem to be centering around mergers, as indicated yesterday and repeated today in a conversation with three graduate students at the Harvard School of Public Health. 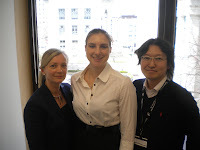 Here they are: Marianne Jurasic, Katie Sullivan, and Ryota Konishi. Perhaps the topic is of interest because people feel that Accountable Care Organizations are likely to result in consolidation of hospitals over the coming years. These students were investigating the impact of hospital mergers on organizational culture, using the merger of New England Deaconess Hospital and Beth Israel Hospital as an example. They interviewed me after having heard from HR organizational development specialist Joanne Ayoub and RN Mary Ellis. As I have noted before, the late doctor Richard Gaintner used to refer to the Deaconess as, "A place where science and kindliness unite in combating disease." That could just as well have been applied to the BI. Given that commonality of values, it is ironic that there were some difficult years immediately following the merger in 1996. The job of the CEO in such a situation is to reinforce mutually held underlying values and help build a new sense of community in the newly combined organization. At BIDMC, the underlying culture of the two antecedent institutions ultimately prevailed, with a clear consensus around a purpose -- caring for patients the way we want members of our own families to be treated, while advancing humanity's ability to alleviate human suffering caused by disease. I have mentioned before the pleasure of living in a city like Boston, with its many colleges and universities, and which therefore provides numerous opportunities to interact with students. Whether they are undergraduates or graduate students, they offer the chance to test one's own assumptions and observations in front of a fresh audience. I always learn something and hope that I can impart something useful as well. 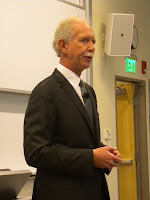 I just finished a great conversation with three students in the Boston University MBA program -- Emily Jochim, Emily Mulligan, and Bill Bruce (seen here. 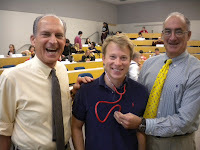 )* The three are taking a class on transformational change in the health sector. They have a final group project, which includes a paper and presentation related to change within an organization. They chose to focus on the role of the senior leader in an organization undergoing a merger. In addition to me, they interviewed Charlie Baker, former CEO of Harvard Pilgrim Health Care; Elaine Ullian, former CEO of Boston Medical Center; and Tim Murphy, President of Beacon Health Strategies. I am looking forward to the paper, but I could see that a major conclusion reached already is that a successful merger is more likely when the CEO adopts a policy of transparency and engagement across the organization. It sounds pretty simple, but it is often not done, leaving the merged organization less capable and successful that might otherwise be possible. * They work at Shire HGT, Tufts Health Plan, and Blue Cross Blue Shield of MA, respectively. Not what I had in mind, exactly. Ken Farbstein, the blogger over at the Patient Safety Blog, has published a book. It is called Getting Your Best Healthcare, Real-World Stories for Patient Empowerment. As the title suggests, Ken uses examples of people with acute and chronic illnesses and combines them to offer thoughtful lessons and suggestions. The stories in this book teach us how to partner with our gifted doctors and nurses, to stay safe while in their care. Patients have relied for too long on the doctors’ brilliance and goodness, believing that Doctor knows best. Doctors do know what’s the best medical care, and we know what’s best for us. It’s time for us to step up as partners in our care. Worth reading for sure, whichever side of the bed you are on. Sometimes when a researcher’s work gets published in an academic journal, intense media attention isn’t the full story. Since last August, when Dr. Jennifer Temel’s article was published in the New England Journal of Medicine, the findings have had a major impact on clinical leaders on the frontlines of palliative care. Just ask Dr. Allan Ramsay from Fletcher Allen in Vermont. He and his colleagues couldn’t pass around the NEJM piece fast enough! For the first time, a prominent study showed that patients newly diagnosed with terminal lung cancer who received palliative care not only experienced less pain and better quality of life, they also lived longer. The benefits of palliative care, and indeed the entire concept, have often been obscured by more intense debates and focus on hospice and what patients need at the very end of life. And, for understandable reasons. But palliative care, as a viable approach and a set of practices that can relieve suffering and improve daily life for patients facing life-threatening illnesses, is gaining ground in outpatient and inpatient settings alike. As we witness this evolution in real time, we also have the opportunity on this next WIHI to get closer to researchers and clinicians shaping the programs and the services. Some, like Dr. Daniel Ray at Lehigh Valley, have been working on building the professional skill sets and patient-centered processes for the past decade. WIHI host Madge Kaplan invites you to a discussion with Drs. Temel, Ramsay, and Ray to learn from their expertise and get a better sense of palliative care as an integrated and integral part of the quality agenda. 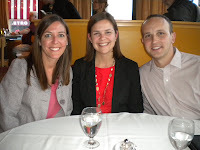 The trio is eager to help others in health care find ways to overcome real and perceived barriers, using evidence, education, and small tests of change. Please join us! What I am suggesting is that clinicians should do their best to collaborate with patients to understand their needs and desires and to jointly design plans of care that are as consistent as possible with those needs and desires. I am not suggesting that patients take over the role of doctors and nurses. I also recognize that there are instances in which patients will be unable to communicate their needs. Then a double burden falls on the clinicians -- not only to help cure those patients but also to do so in a manner that would be most sensitive to the likely concerns of the patients. None of this requires clinicians to assume expertise that doesn't exist on the part of the patients, or to give up their own moral or ethical beliefs or belie their training or experience. Instead, it suggests that, to quote e-Patient Dave, "Patient is not a third person word." Or, as Charlie Safran said in 2004, "I want to note especially the importance of the resource that is most often under-utilized in our information systems – our patients." In short, it suggests a partnership between patients and clinicians that will allow both to do a better job in carrying out the healing process. Simple? No. It requires mutual respect, intellectual modesty, a lack of entitlement, and a somewhat paradoxical combination of engagement and detachment that will be hard for both clinicians and patients to carry out. But the upside is huge, for both, if we can learn how to do it. Congratulations to Maureen Bisognano, CEO of the Institute for Healthcare Improvement, for being named by Modern Healthcare as one of the Top 25 Women in Healthcare in 2011. 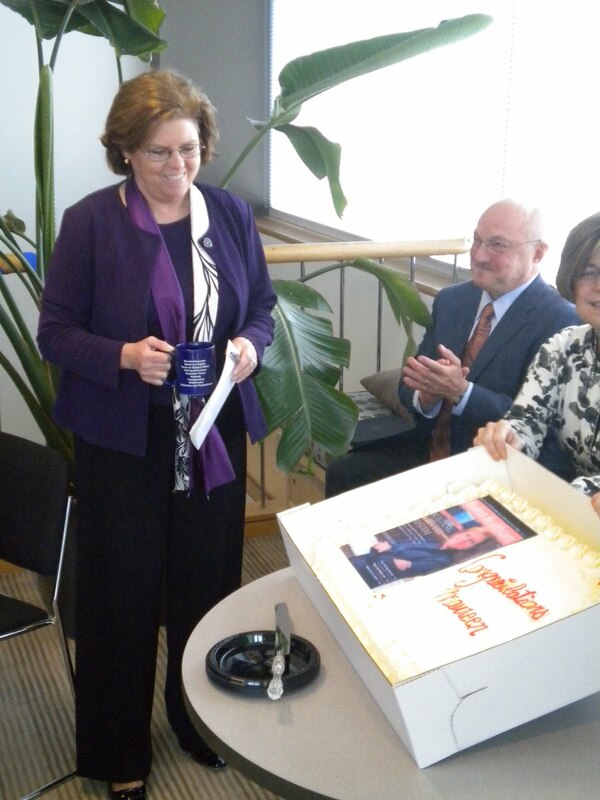 I happened to be at IHI today when her staff presented this celebratory cake, complete with a copy of the magazine's cover with her portrait as a decoration. 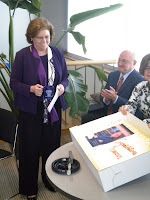 In her usual modest fashion, Maureen attributed her recognition to the excellent work done by all of the people at IHI. The winner will receive $5,000 and be honored at the Kenneth B. Schwartz Compassionate Healthcare Dinner on November 17th at the Boston Convention Center. Last year’s event attracted more than 2,000 attendees. Four finalists will also be recognized and receive $1,000 each. Nominations are due May 18, 2011. Information on how to nominate a caregiver for this prestigious award is available on the Schwartz Center’s website. This story about the Joint Commission in the Boston Globe is disheartening. The national organization that accredits hospitals will tackle the failure of medical staff to respond to patient alarms, making it a top priority this year. In 2004, the commission decided to make improving alarm safety part of its national patient safety goals, which signaled it was a high priority. However, the agency soon dropped the goal, thinking that hospitals had solved the problem. The Joint Commission seems to need to spend some time getting a focus on things. It makes animated cartoons about avoiding the spread of germs. It refuses to make its library of hospital best practices widely available. Even in this story, it seems to fear transparency: "He wouldn’t release numbers, but Schyve said the Joint Commission is getting more reports of hospital staff not responding to crucial alarms, or alarms being shut off." This is the group that accredits hospitals for participation in Medicare. How can Congress let an accreditation agency that works for the public be so opaque with regard to clinical information and with regard to its progress in working on systemic change in hospitals? Since last October, I have been the in-country coordinator of a new, integrated rural health and development program outside of Siem Reap, Cambodia. 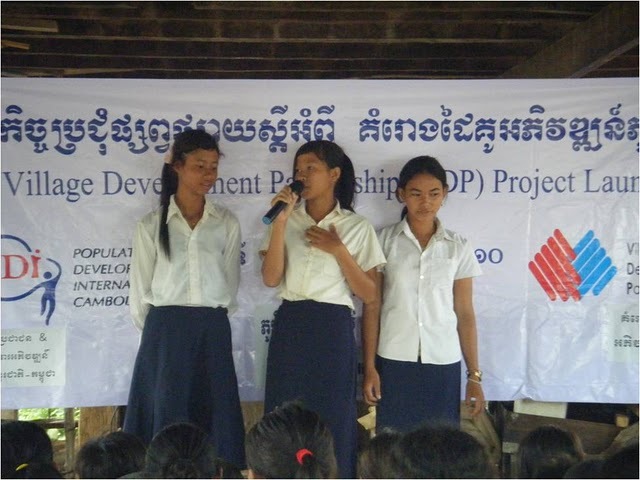 Our organization, named Population and Development International – Cambodia, has stemmed from the Population and Community Development Association (PDA), which is Thailand’s oldest and largest NGO and a pioneer for family planning, HIV prevention, and rural development services. I worked in the health department at PDA in Bangkok for 1 ½ years before moving here, where I discovered a whole new range of challenges and opportunities. 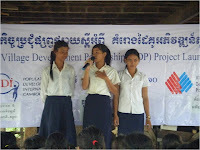 PDI-Cambodia is implementing a project called the Village Development Partnership (VDP), which strives to help rural communities improve their quality of life through community-led activities in health, agriculture, education, income generation, and social mobilization. 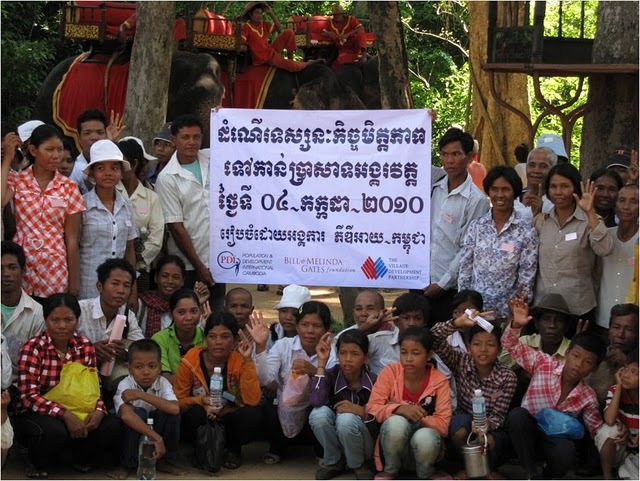 The key element, which makes this project distinct from most NGO’s work in Cambodia, is that every element is community-directed. After gaining the trust of the community – which took us 6 months of relationship-building the first time around! 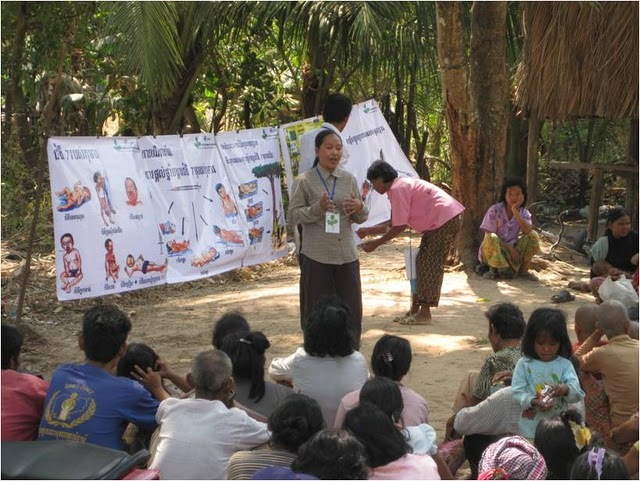 – the field staff facilitated a democratic election of a 30-member committee that is at least 50% female and that includes sub-groups for health, youth, and village bank programs. The committee will facilitate all future VDP activities in the villages, including an initial quality-of-life and needs assessment that will identify villagers’ priorities in various areas of development. 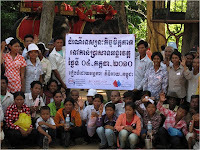 We are starting the project in one commune (sub-district with 9 villages) outside of Siem Reap. We work in an area that has no electricity, substantial maternal and child morbidity, and poor water and sanitation access (there is no water available for 5 dry months every year, and each village has only a handful of latrines). Most people are rice farmers but have not diversified their agricultural skills, mostly because of sparse water availability, so they are completely reliant on uncontrollable factors that determine annual rice yield. Average annual income is less than $200. Thus, the needs are great, and the stakes are high. Although it took a long time to earn villagers’ trust and identify successful strategies for partnering with the rural communities, now excitement is building among the villagers (and consequently among the staff) about taking steps to promote their own well-being. At this time, each village committee has finalized its development plan and is ready to move forward with implementation, in partnership with PDI-C, whose role is to identify skills building opportunities and other required resources for each village. It is truly humbling to watch as the villagers gain confidence, insight into new ideas, build new connections in their community, and initiate projects on their own. In a matter of weeks, the village committees have mobilized villagers to re-dig and dig new canals (critical preparation for the rainy season), installed trash bins in front of most houses, conducted village cleanings, made village boundary markers, and more. With our support to organize themselves and think through their own situation, the villagers have developed a reasonable action plan and are getting started in substantial ways. This work is tremendously demanding and enlightening. I work with a great staff of dedicated Cambodians. Together we are adapting a complex model from Thailand to fit the unique Cambodian setting. This means that we have to consider whether or not every step of the Thai model will work here, and more often than not it cannot. I learn new things every day about village dynamics, all levels of government, Cambodian culture, and more – I could write a book! There are two kinds of doctor: those who have been involved in a serious incident and those who will be involved in a serious incident at some point in the future, sometimes as a result of their own error, and sometimes due to the circumstances under which they must carry out their work. It is usually a combination of both, and subsequently the doctor almost always feels responsible for the unintended harm caused to the patient. It is difficult to discuss this kind of experience with others. Openness requires courage, but also an environment that is prepared to listen without prejudice. In this book, several well-established Dutch physicians share with us a very personal glimpse into a past they are not proud of, but one that forms an inherent part of their professionalism. They hope to contribute to a culture in which it is normal to talk constructively with each other about the darker side of healthcare, about the vulnerability and fallibility of health care providers. Openness as a medication. Governments often slip little-noticed and seemingly unrelated items into their spending plans, but just a single line in the recent provincial budget measures bill is causing a split within Ontario’s medical community. The provisions take effect Jan. 1, 2012. The new amendments come just a few months after the government passed Bill 122, the Broader Public Sector Accountability Act, that provided broad public access to hospitals’ administrative and policy-related information for the first time by subjecting them to the freedom of information act. The latest proposed changes would partially reverse those reforms. Health Minister Deb Matthews has defended the move to exempt information related to quality of care from public release. According to the Free Press, Matthews believes subjecting hospitals and doctors to greater scrutiny would prevent open dialogue about problems and how to fix them. “They must have a very open and frank discussion,” she said. Apparently most of the Danish hospital managers who were present felt that one should be cautious in opening the door to more information that exposes the hospital's deficiencies. The Director of the country's largest hospital, Odense University Hospital, Jane Kraglund, believes that the hospitals already publish enough data about quality. "Our quality is transparent, but we do not learn much by putting a malpractice on the website. When we make mistakes, we have a strict system where the error is systematically reviewed, but it will not necessarily come out to the public. Moreover, more information about risk would be more confusing for the patient, "says Jane Kraglund. "We are constantly in a competitive situation, and our standing could be damaged if there are too many bad stories about a place where you expect to get the best treatment. Clearly we will inform patients about possible errors, but the question is whether we should only do it to the patient or to the whole public. I am in doubt as to whether he mistakes we make always give rise to learning." Proving I guess, that the survey I did that day in Denmark may not have been quite honest or accurate! Proving also that a fundamental problem is that doctors do not believe the public will accurately or fairly judge hospitals that are honest about such matters. We never found that to be a problem at out hospital, and we were as transparent about such things as you can imagine. Our market share actually grew following our decision to be open about our clinical results, as clinical partners who agreed with our philosophy referred patients to us. It is time for health care professionals to understand that patients can be trusted to be active partners in process improvement. Disclosure of clinical outcomes is a first and necessary step along that path. I have great admiration for the folks at Health Care for All, an advocacy group here in Massachusetts, but they appear to have missed a major point about health care reform. Here's the story. The state insurance exchange agency, the Connector Authority, recently offered a new option for the subsidized insurance plan offered under state auspices by Network Health. 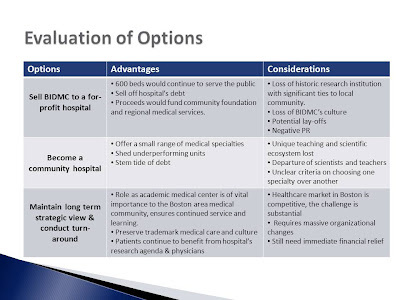 To save money, Network Health proposed and the Connector approved a limited network that excludes the hospitals in the Partners HealthCare system. This was in recognition of the dramatically higher rates charged by PHS hospitals and the doctors who work in those hospitals. In choosing to exclude those hospitals but include other ones in the highly competitive Eastern Massachusetts market, the executive director of the Connector found that the result "must and does meet our network adequacy standards." Health care advocates said they were pleased that the state was able to keep the program intact and affordable for patients, despite steeply rising health care costs. Amy Whitcomb Slemmer, executive director of the advocacy group Health Care for All, said she is concerned, however, about narrowing patients’ choices for medical care. She said the group will watch to make sure residents get the care they need. “Limiting networks is a short-term solution to our long-term problems of redesigning the health care system so it meets the needs of consumers’’ and controls costs, she said. I am worried that HCFA people may have believed the President when he said we could have access, choice, and lower cost. We know it is just not possible in the current insurance market environment in Massachusetts. As long as there are out-of-market prices for some hospitals, the fastest and best way for an insurance company to save money is to exclude those high-priced providers. The good news is that there are several lower cost systems that are of high quality. So, we don't have to worry about whether "residents get the care they need" under the Connector Authority's decision. Here's one I'm not sure if I believe. What do you think? There has been a lot of research on brainstorming over the years, and it generally shows that groups are less effective than individuals. That is, if you got a group of three people brainstorming, that group would come up with fewer ideas (and fewer good ideas) than if the people had worked alone. This observation that groups are less effective than individuals is called productivity loss. A potentially powerful aspect of brainstorming, though, is the process of combining ideas. That is, after a set of ideas are generated, it may turn out that a combination of a few of the ideas is more effective than any of those individual ideas alone. Are groups more effective than individuals when combining ideas? [P]eople working in groups . . . were particularly productive when given rare ideas. [Rare ideas were ones that were unusual from the norm.] The groups generated combinations that were much more novel and yet still quite feasible to implement when given rare ideas. That is, groups seemed particularly well-suited to taking rare ideas and creating new and interesting combinations from them. I am a bit skeptical mainly about the first part, in that I have seen very effective brainstorming sessions that have generated great ideas. In any event, in my view, the major value of brainstorming is not the substantive ideas that emerge. It is the creation of teamwork and collaboration along the way. In an organization, this is actually more important than the particular result. 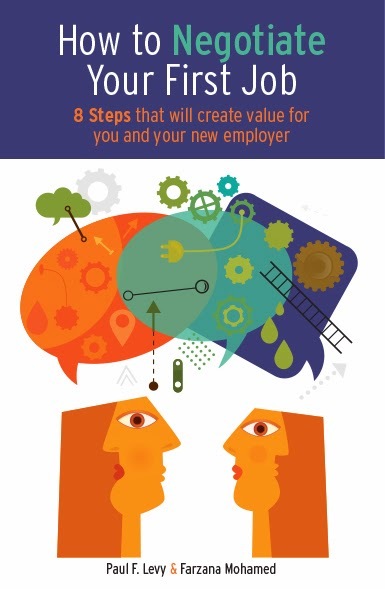 Brainstorming is a trust-building exercise that offers the advantage of helping people propose ideas without the burden of ownership, understand each other's interests, trade on differences, and thereby reach a sustainable negotiated result. 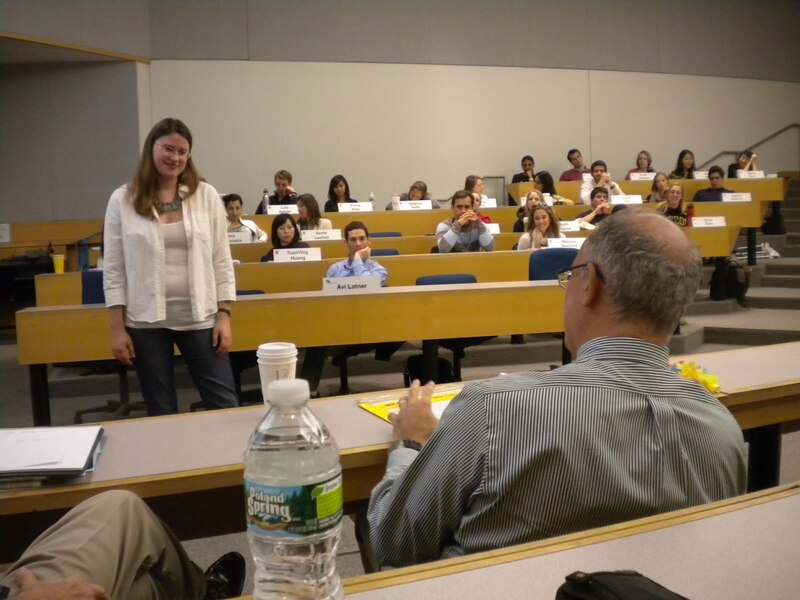 I just gave a guest lecture at an MIT Sloane School class entitled, "Managing in Adversity." 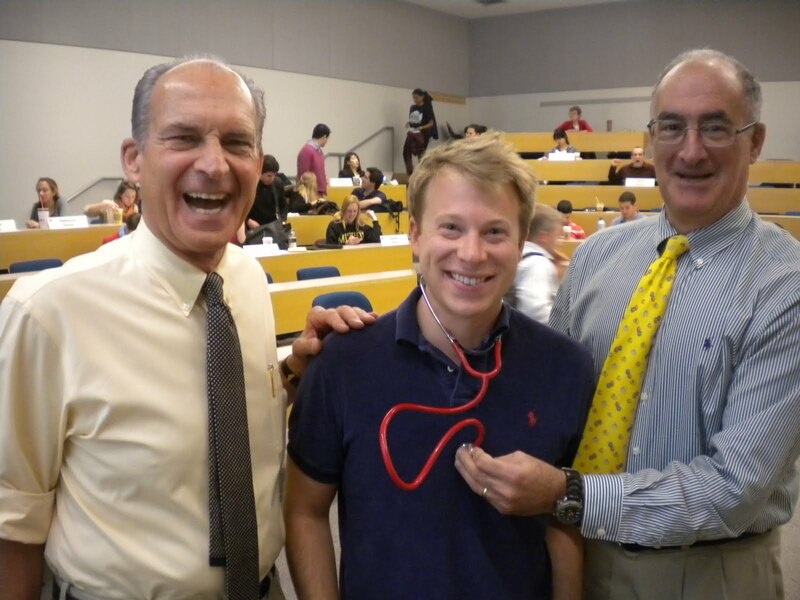 Professors Peter Kurzina and Howard Anderson (seen here with teaching assistant Andrew McCarthy) invite CEOs from a variety of backgrounds and industries to reminisce about periods in their leadership careers that presented significant challenges. I was asked to talk about the turn-around of Beth Israel Deaconess Medical Center back in 2002, six years after a merger that was not working out very well. The class begins with a presentation by a student, as though that person were the CEO at the time of the organization's crisis. Every student prepares for this presentation, and one is chosen at the last minute. In this case, it was Marlena Ruth Hubley, an MBA candidate in the Class of 2012. 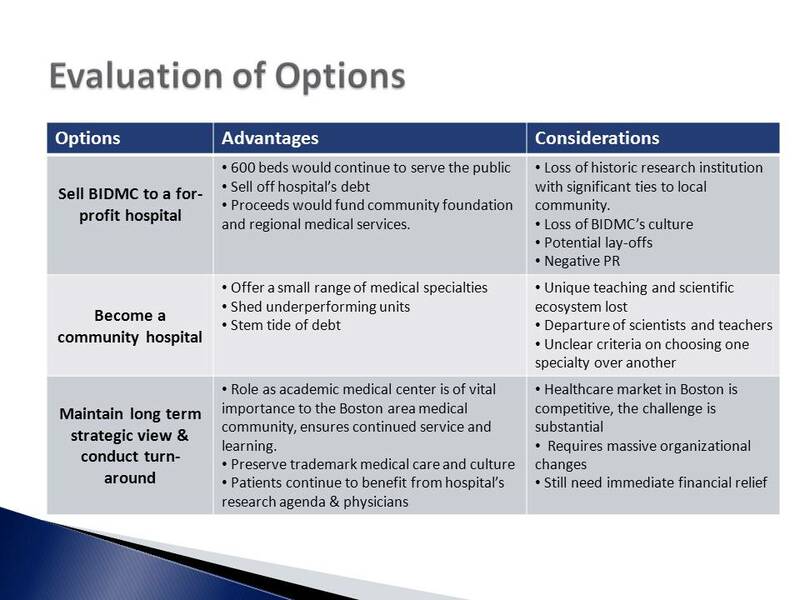 This was her slide accurately outlining the options faced by BIDMC in 2002. You see Marlena above being grilled by Howard after her presentation. She did very well, indeed. If you want read more about the context for that period of time, outlining the nature of the problems we faced and my initial approach to them, you can read more here. 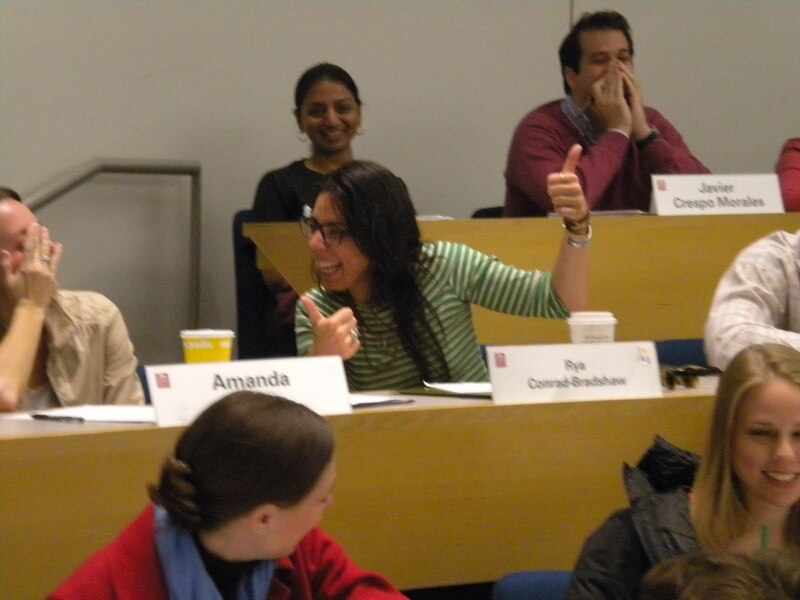 In addition to Marlena, many other students were engaged and thoughtful participants during the class. I attach a couple of pictures here of two who gave very good answers to questions I posed. I really don't want to pick on The Joint Commission, as they do so much good. But what's the story with this animated video called "Speak up™," about spreading germs? Is the JC now in the public health business? What's the audience? Is this really a compelling way to send the message? Who's idea was this? They are spending money on this, but still not making widely available their library of best practices from the hospitals they have been paid to survey? I wanted to embed the video here so you could see it. It is available from the JC, but first you need to tell them "how you plan to use the Speak Up™ video(s)." I didn't try. I didn't think they would like how I would use it. But here again, we see an indication of an unexplained need to control the distribution of information. They could just have put it on YouTube and let it go viral. Finally, what's with the trademark? Do they expect to sell this feature some day? Kathleen M. Haig, RN, Corporate Patient Safety Officer, OSF Health Care System It’s safe to say that reducing harm is a priority at virtually every health care delivery organization today in the US. Few health care leaders waste time anymore defending high rates of hospital-acquired infections or medication errors. Progress is also notable in this country and other nations similarly focused on improvement, when it comes to declines in infections associated with central lines, ventilators, and resistant bacteria, and reductions in events such as preventable patient falls. That’s the good news. The mixed news is that when independent researchers dig deep into patient charts and look for signs (or triggers) of adverse events using the IHI Global Trigger Tool (GTT) or something approximate — conducting reviews over a month, several months, even several years — they’re finding higher rates of harm than even the most committed improvers realize exist, especially if they’ve been relying on other, common detection methodologies. The latest findings to reinforce this gap in perception and facts on the ground have just been published in the journal, Health Affairs. The article’s two leading authors, David Classen and Roger Resar, would like to help everyone make better sense of the mounting evidence that points to the power of the IHI GTT as a measurement and detection tool. WIHI host Madge Kaplan welcomes the two to the next program, along with IHI Vice President Andrea Kabcenell and Kathleen Haig of OSF St. Francis Medical Center. Drawing on our guests’ expertise, the goal of this timely WIHI is to explain why overall rates of adverse events haven’t been as affected by improvement strategies as many would have expected; how use of the IHI GTT can deepen understanding of where problems persist; what improvement strategies may best address areas in need of attention; and how it’s possible to work successfully with the GTT as part of an overall patient safety and harm reduction strategy — just ask OSF, which has seen marked improvement across their system and raised awareness with help from the regular, routine use of the GTT at seven hospitals. We know everyone is working hard on multiple fronts to improve quality and safety. If efforts can become more targeted and effective, based on more robust detection methodologies, that’s a good thing. And, that’s why we look forward to all your questions and committed participation on this next WIHI! Recapping and handicapping the MA insurance "market"
The fastest way to raise hackles among Massachusetts hospitals, doctors, insurance companies, and even businesses is to suggest that a state rate-setting body would do a better job in setting payment rates between insurance companies and providers than the marketplace. Well, let's test the proposition about the efficacy of that "marketplace." Here is a short synopsis of the experience with the dominant insurance company over the last decade. First, as documented so clearly by the Attorney General, pay above-market rates to the dominant provider system in Eastern Massachusetts, and also to geographically monopolistic smaller hospitals in the state. Transfer hundreds of millions of dollars in extra revenue to the dominant provider, permitting it to become still more dominant by investing in huge regional ambulatory care centers and acquiring physician groups. In so doing, assure an increase in patient volumes away from lower cost facilities and doctors, helping to fuel the rapid increase in health care costs in the state. Second, citing your concern for the rising cost of health care, propose a move towards capitated, or global, payments. As disclosed in Commonwealth Magazine, pad the global rates you pay to the early adopters, to give them an incentive to take on the actuarial risk of those patients. Third, in response to the state's arbitrary limitation on premiums for small businesses and individuals, squeeze those hospitals whose contracts come up for renewal. This further aggravates the reimbursement disparity, as many of those providers are not the ones who are above-market in the first place. By squeeze, I mean that you start off by offering a negative or zero rate increase to those hospitals. After negotiation, maybe you settle for 2 or 3 percent. Meanwhile, the dominant provider has a built-in contractual rate increase far in excess of that. The parties agree to experiment with bundled payments for certain diseases and procedures, staying far away, though, from a full system of capitation. The parties agree to a general rate increase of just a few percent. Together, they will say, this will "bend the cost curve" for this large group of doctors and hospitals. There won't be much talk about the fact that the base upon which the bundled payments and other fee-for-service payments is set remains far above market. End result: Continued use of market power as the prime determinant in setting reimbursement rates. I apologize in advance if some of you are tired of hearing about Massachusetts and its experience with different payment models for health insurance. I write about this, not only because it is interesting locally, but also because people around the US are watching to see how the experiments here might or might not be applicable to the rest of the country. I have written before about the pro's and con's of capitated, or global, payments as an alternative to fee-for-service payments. There are arguments to be made in support of each. But the problem in this state is that the movement towards global payments has become a matter of religious dogma. The main practitioners of the system have not been willing to divulge the kind of information needed to evaluate it properly. That lack of transparency undermines the policy arguments that might be used to advocate for an expansion of this approach. But, eventually, more and more of the story comes out, and it is less than pretty. A few weeks ago, I quoted a report by the state's Inspector General in which he raises concerns about this issue. He noted, "[M]oving to an ACO global payment system, if not done properly, also has the potential to inflate health care costs dramatically." Now comes an article by Pippin Ross in Commonwealth Magazine, entitled "Piloting Global Payments." It has some revelations that give credence to the concerns raised by the IG. Blue Cross padded first-year global payment budgets to entice hospitals and doctors to sign on.... [T]he current goal is not to actually reduce costs, but to cut in half the rate of growth in medical costs after five years. But, of course, we don't really know, do we? We have no way to validate any of this. Sorry, but "trust us" just doesn't cut it when it comes to this kind of significant change. Some insurance companies are particularly pleased with this approach because it shifts risk from insurers to providers and makes it easier for the insurers to create budgets and price their products. I know of no other arena in public policy in which so many decisions are being made with so little substantive support and so little data-driven debate. ePatient Dave offered this marvelous talk at TEDx Maastricht. The whole thing is worth watching, but you can see the highlights starting at minute 13:08. I wonder if the people at JAMA are ever going to understand that the journal would have even more influence if they made articles of a general nature free and available for all to read. Especially when the article makes a recommendation to the general public. Here is one example, a thoughtful book review in the April 6 edition written by Dr. Leonard Berlin. The topic is Overdiagnosed: Making People Sick in Pursuit of Health, by H. Gilbert Welch, Lisa M. Schwartz, and Steven Woloshin. The next sentences are: As a result, contend the authors, although a few will be helped, many will be overdiagnosed, and some will be harmed. This theme permeates the book. This is very important stuff. A scientist friend reminds me that, as a general matter, the predictive value of a screening test is mathematically related to the prevalence of the disease in the screened population; so the less prevalent, the tougher it is to have a high predictive value. That the prevalence of overdiagnosis has reached epidemic proportions, according to the authors, is attributable to the changing guidelines regarding numerical values of what is considered normal and abnormal as well as to technological advances in radiologic imaging. According to data documented in the book incidentalomas are found in the lungs of 50% of otherwise “healthy” persons undergoing computed tomography of the chest; in the kidneys and livers of 23% and 15%, respectively, of those undergoing computed tomography of the abdomen; and in the thyroid glands of 67% of those undergoing ultrasound examinations of the neck. The chance that the incidentaloma could represent a lethal cancer is considerably less than 1%. In all of these areas, the authors argue that the quest to find potential disease which may not exist or, if it does, will never harm the patient often leads to unnecessary surgery and medication that may cause serious adverse effects as well as patient anxiety and ever-increasing costs. Overdiagnosed is a provocative, intellectually stimulating work. As such, all who are involved in health care, including physicians, allied health professionals, and all current or future patients, will be well served by reading and giving serious thought to the material presented. A hearty welcome to the blogging world to Barry Ronan, President and CEO of Western Maryland Health System in Cumberland, Maryland. This is his second day, so head on over and give him some positive reinforcement! An aside for frequent fliers, catch these wind speeds yesterday at Keflavik Airport in Iceland. You can convert meters/second to miles/hour by multiplying by 2.2, yielding a peak velocity of almost 100 mph. After a three-hour flight from Copenhagen, we waited four hours on the tarmac for the wind to settle down enough to safely roll up the jet bridge and disembark. You may know the old rock and roll song of this title. Well, I keep hearing the same old song, but it is not with a different meaning as I take leave of another country (this time, Denmark) that is trying to determine the direction for health care for its citizens. Here is the song I hear from medical professionals in every developed country I have visited over the last several years and from delegates of countries who have come to Boston to explore ideas. I hear about the same demographic trends. There are three cohorts: (1) The elderly, who are living longer than ever, whose diseases -- even cancer -- are chronic in nature, requiring supervision, ongoing diagnosis, expensive drugs and often hospital-based treatment; (2) The baby-boomers, the entitled children of the 1940s and 1950s, who are just entering the age of hospitalization for serious diseases and who believe they have the right to elective procedures for aches, pains, and conditions that prior generations would have just lived with; and (3) The next two generations, often sedentary and malnourished, who are obese and developing life-long sequelae from unhealthy lifestyles. In those countries with long-standing national health systems, which have properly emphasized the importance of primary care, I see a tendency to adopt the "rule of rescue" and otherwise believe that their tertiary treatment needs to be on par with the US. They are prepared to invest millions in facilities and equipment to make this so. Meanwhile, the US is about to start catching up with the world by providing access to care and especially primary care. For the foreseeable future, as people begin to have the kind of early diagnostic testing they deserve, there will actually be an increase in their health care expenditures. Conditions which would have laid dormant until the patient presented in the Emergency Department will instead be discovered sooner, requiring intervention and treatment. In all countries, I see the medical-industrial complex at work, inventing new approaches to diagnosis and treatment. These approaches will often meet FDA-like regulatory approval for safety; but they will not be judged for relative efficacy. Doctors, particularly those in academic medical centers and other prestigious or ambitious hospitals, will demand the acquisition of these devices and drugs. They will not be drawn to them by cost-effectiveness. They will acquire them because they are the latest, because they want to keep up with the competition, and because they believe them to be necessary to gain market share. They -- abetted by direct-to-consumer advertising -- will help convince their patients that they need these new devices and drugs. In short, perceived reputation will often outweigh efficacy in the value equation. These factors are compounding each other's impact to lead every developing country to an unsustainable increase in health care costs. All of this is not going on without notice to the people who pay the bills -- the government, the insurance companies, and/or the employers. They are putting pressure back on the system, but they use methods that are crude and unproven. Medicare, for example, will focus on "never events," penalizing institutions as though those institutions want never events to occur. Others repeat the religious dogma of capitation, while providing no evidence that capitated systems have produced the desired result. Accreditation agencies focus on minutia, checking off their own checklist with no cognizance of the cost impact brought about by nitpicking that distracts from real process improvement. In national health systems -- and incipient in the US, too -- parallel systems of high-end insurance products are offered to those who can afford them. These products reduce equity in countries for whom equity and solidarity has always been important, but give the government an "out" in the provision of premium service. To the extent the medical profession continues to abdicate responsibility, the more will step in politicians, regulators, and payers to do it for them. If you are a doctor and already feeling a lack of control over your professional life and your relationship with your patients, just wait. But I was reminded of another point last week in Denmark. Part of taking control is to ask for help, and you folks need help from other industries and fields that have learned to deal with structural change and process improvement. You can't keep saying, "But we are different." Everyone is different. Teach them what they need to know so they can teach you want you need to know. It was great to see that the folks at the Copenhagen conference have accepted that. Here is the result to the question of whether they thought they ought to bring in people from other industries to help achieve their goals. "Ja" is definitely the right answer. It is a demonstration of the intellectual modesty needed to make progress. If you have made it this far, you have probably heard enough from me today. Just for entertainment, here's the actual song. So, you can imagine my excitement upon encountering this behemoth, the Hvalfjörður Tunnel. As noted by Wikipedia, it is a road tunnel under the Hvalfjörður fjord in Iceland and a part of the Hringvegur (Iceland's ring road). It is 5,762m long and reaches depth of 165m below sea level. Opened on 11 July 1998, it shortens the distance from Reykjavík to the western and northern parts of the island by 45km. Passing the fjord now takes 7 minutes instead of about an hour before. You can get a sense from the accompanying map. The tunnel is at the lower left, while the previous route circumnavigates the fjord. It is actually a bit scary to drive through, especially the first time. It is very long, with a long winding curve, not very bright lighting, and quite a gradient up and down (making it hard to maintain the 70 km/hour speed limit). I thought I would give you an impression of that, so I mounted a camera on my dashboard and produced this video. Real infrastructure geeks will watch the whole video and complain that I did not film the entire ride. Regular people will say, "You made a video of a tunnel?!" We can't leave Copenhagen without mentioning three important features -- pastries, bicycles, and architecture. First, let's address the issue of Danish pastries, as we call them in the US. The original Danish pastry was actually made by bakers from Vienna who were in Copenhagen in the late 1800s. The Danes still call it wienerbrød. However, it was modified from the original, so when you ask for it in Vienna by that name, they don't think it is their native pastry and so don't call it that. They call it Kopenhagen-Geback! Now, on to biking. This is a major mode of transportation in this city. In fact, this site notes, "According to the Technical and Environment Committee of Copenhagen, the Queen Louise Bridge - located in the the Danish capital's northern borough - holds the world record of daily passing cyclists with a staggering number of 36,000 people (!) crossing the bridge every day between 7AM and 5PM." They site further notes, "According to the Cyclist Embassy of Denmark, 36% of all Danish adults ride a bike to work." This is made possible by a simple innovation now known worldwide as the "Copenhagen lane." This is a distinct and separate lane between the sidewalk and the street dedicated to bicycle traffic. It is physically separated by a height differential from the roadway. The bikes travel in the same direction as the adjacent auto traffic. At intersections, the lane is distinguished by blue paint, and there is often a separate traffic signal for the bikers. I have always been told that this would be too difficult to do in Boston because it is an old city with narrow streets. Hmm, Copenhagen is older and likewise has space limitations, but they have made it work. If you don't separate the lane, you get results like the one on Commonwealth Avenue portrayed on this web site. But, being bike friendly goes beyond that. The city's Metro service is designed to encourage multi-modal transportation. Bikes are welcome, and the train cars are designed to leave room for them and to permit easy ingress and egress. Try that on the Boston "T" and see what happens! And, finally, architecture. The city has a spectacular mix of old and new, from this lovely bell tower with an external stairway on the Church of our Savior, Vor Frelsers Kirke, to new waterfront structures: The Royal Danish Theatre, the Opera House, and what is called the Black Diamond, a strikingly modern extension to the Royal Library. The walls are tilted in from the top, allowing it to reflect light and activity on the canal in front of it. Here is a view from our canal boat tour when the sun was behind us, as we approached and went past the building. You can find other views of the city on my Facebook page, here. Here is a touristic Copenhagen interlude, although with a medical tilt, thanks to a tour given by Dr. Peter Skanning. The site we will discuss is Bispbjerg Hospital, built between 1907 and 1913, with a marvelous layout of buildings and gardens. I present more on the architect, Martin Nyrop (1849-1921), and the architectural features in the post below. Peter is an anesthesiologist who runs the hospital's poison center, but he has a strong interest in architecture and history, and he kindly gave me and others an extensive tour. "I was sitting in a meeting when Duckwitz asked to see me. 'The disaster is going to take place', he said. 'All details are planned. Your poor fellow citizens are going to be deported to an unknown destination'. Duckwitz's face was white from indignation and shame." According to Duckwitz, 1 October was set as the zero hour and Hans Hedtoft immediately warned C.B. Henriques, the head the Jewish Community, and Dr. Marcus Melchior, the acting chief Rabbi of the Krystalgade Synagogue. On September 29th, two days before the projected round up on Rosh HaShannah, the Jewish New Year, Dr. Marcus Melchior implored his stunned congregants and the whole Jewish community to go into hiding immediately. Two German passenger ships, docked in Copenhagen’s port, were ready to ship approximately 5,000 Jews to Germany on their way to kz camp Theresienstadt. Buses were to take the remaining 2,500. The word was passed and the Danes responded quickly, organizing a nationwide effort to smuggle the Jews by sea to neutral Sweden. The Danes dropped everything to help family members, neighbors, or friends and offered their support, conveying warnings and finding places for the Jews to hide. The Danes felt that persecution of minorities was a breach of Danish culture and they were not prepared to stand for it. From all strata of Danish society and in all parts of the country, clergymen, civil servants, doctors, store owners, farmers, fishermen and teachers protected the Jews. Dr. Koster, who was in charge of Bispebjerg Hospital, was instrumental in arranging for hundreds of Jews to be hidden at the hospital before they made their escape to Sweden. The psychiatric building and the nurses' quarters were filled with refugees, who were all fed from the hospital kitchen. Virtually the entire medical staff at the hospital cooperated to save Jewish lives. Once it became known among Danes what the hospital was doing, money was donated from all over the country. The Danish police and coast guard also took sides with the oppressed by refusing to assist in the manhunt. To make their escape, many refugees were driven to the coast in ambulances belonging to the hospital. One reason it was possible to hide all these people is the layout and architecture of the hospital. See the model in the photo at the top or the architectural drawing to the right. The hospital has thousands of rooms, almost impossible to count. It also has dozens of buildings connected by miles of underground tunnels. It is virtually impossible for anyone unfamiliar with the buildings and the tunnel system to find people who are hidden throughout the campus. But, let us not understate the bravery of those involved in this rescue attempt. This was a spectacular humanitarian mission carried out by the populace of an occupied country. They truly risked their own lives for the sake of others. This was a mitzvah of the highest order.